Disclosure: This is a sponsored post written by me on behalf of Dansk® Everyday Dinnerware. 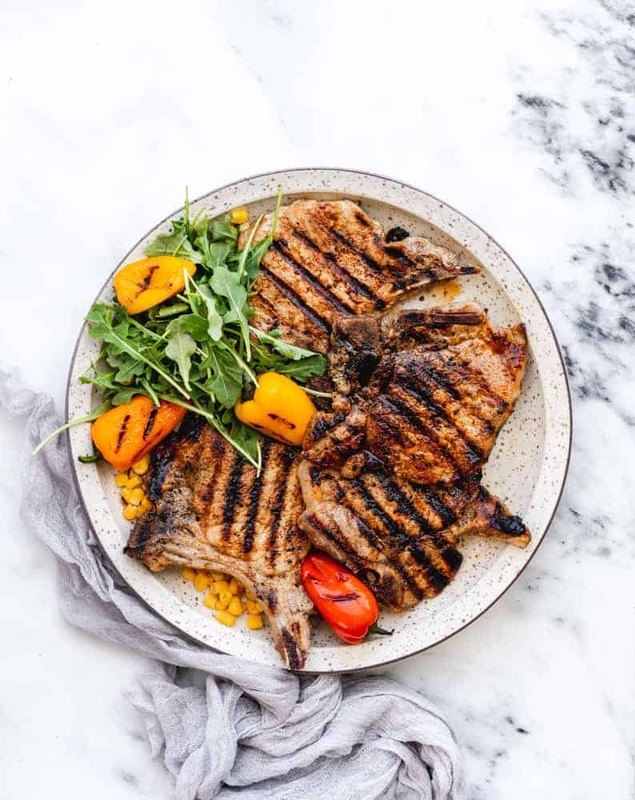 Today I am going to share my favorite easy summer recipes: fresh Asian Cabbage Mango Salad with Grilled Shrimp, easy grilled pork chop, and gazpacho, all served on the beautiful Dansk Kallan collection. I’ve been a big fan of Dansk for my entire life. They always create beautiful designs on cookware, dishes, plates, flatware and serve ware that are perfect for every get together. I was excited to partner with them as using Dansk makes a dish or an entire table setting look amazing. Even a simple salad will catch people’s eyes when on a Dansk plate or bowl. 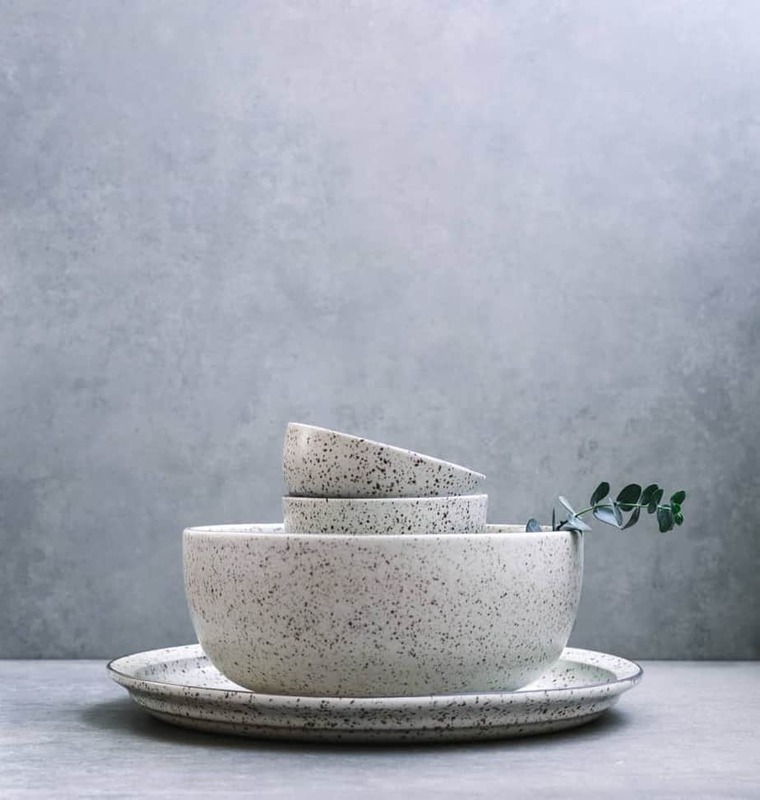 This particular stoneware collection has beautiful speckled brown and cream colors, a motif that works well year round (I’m just picturing my favorite wild rice soup recipe in these on a cold winter day!). I think these summer recipes look great as well. 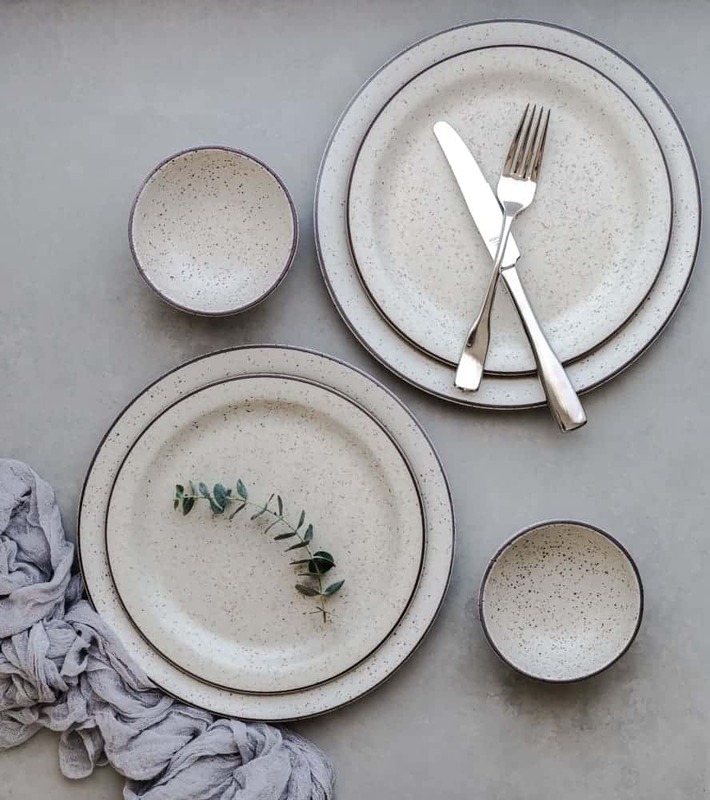 You can feel the quality of this stoneware; they are heavier and don’t feel like they’ll chip or break easily like other plates I have. The stainless flatware is also of a heavier, better quality, yet has elegant shapes and curve. 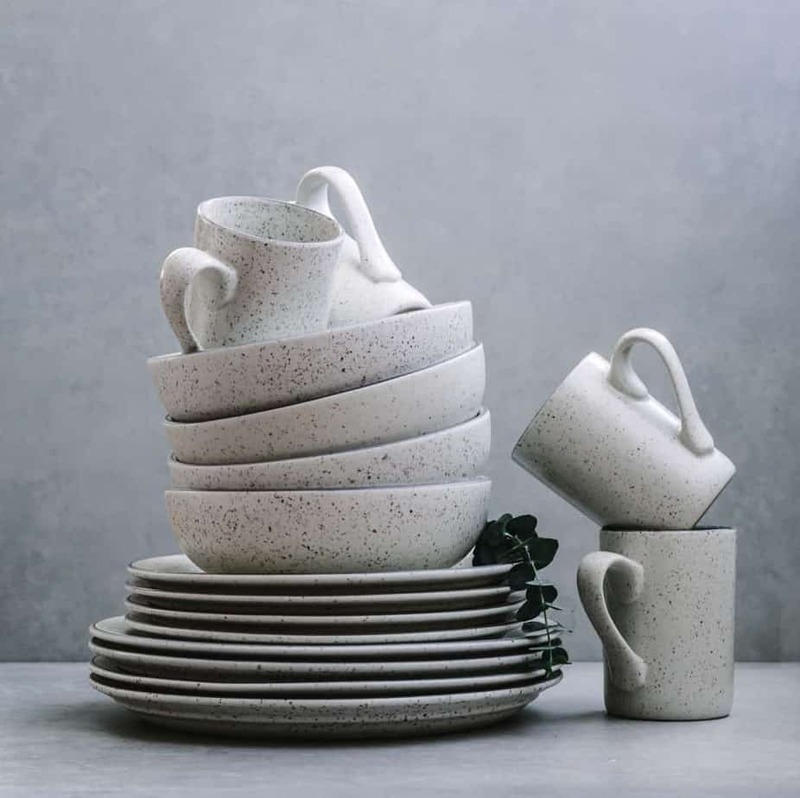 Dansk has always been a front-runner of giving stylish products that function well in our typical American households (on that note, these are dishwasher and microwave safe). I’ve been obsessed with Dansk cookware and actually spend some time each week bidding on their antique items. I love the pride that they put into their products, they’re built to last and all of their designs are timeless. 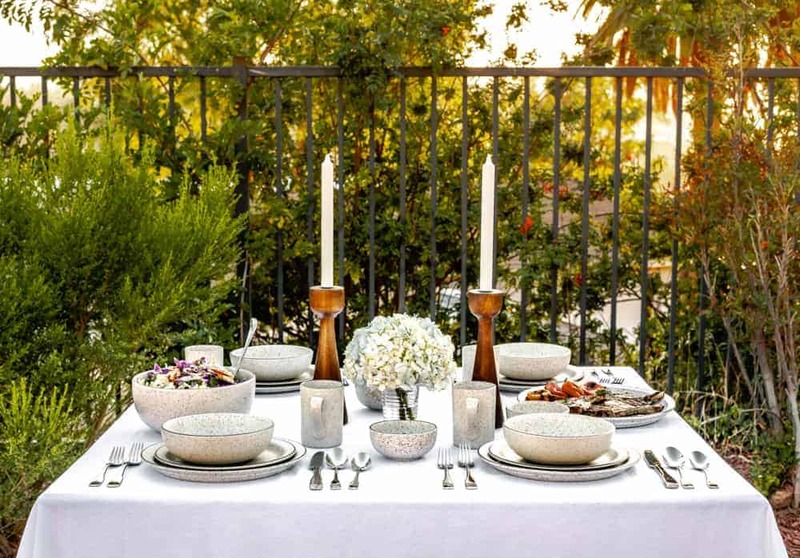 I can’t wait to host some more gatherings at my house to show off the Dansk Kallan collection. I already know which of my friends and family will likely want to go out and get the same set, and I know they too will be pleased with their purchase. Summer is always a busy season for me and my family. It’s the perfect time to get together and to do more outdoor activities. I am a big fan of eating seasonal produce, and I also love serving light and easy recipes where I don’t have to spend a long time in the kitchen. I recently made a delicious Asian Cabbage Mango Salad with Grilled Shrimp, easy grilled pork chop and gazpacho. Below you can find the recipes. The Asian salad has two types of cabbage which are healthy and bring out some nice colors, cilantro (which I absolutely love, but know that it’s not for everybody), peanuts, mango and sesame seeds. 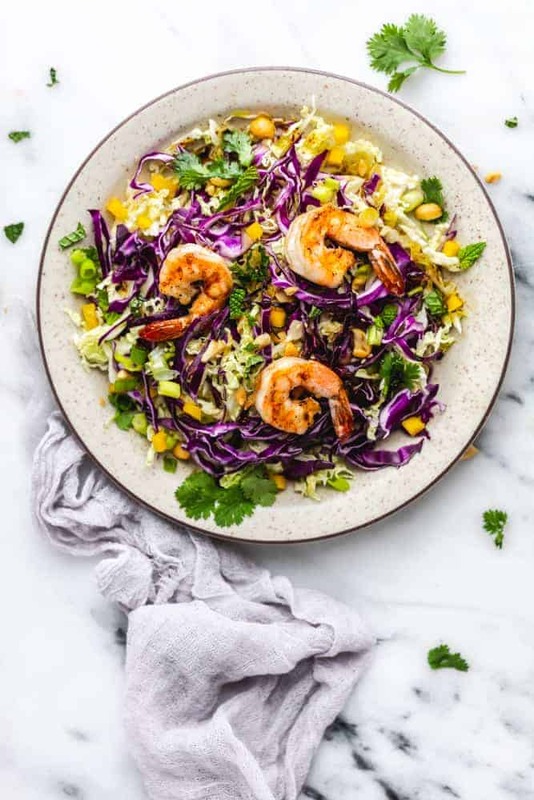 I like having shrimp in the salad as I think it goes quite well with the cabbage and peanuts, and also gives the salad a great boost of protein. The dressing is light, which is how I prefer it, and is quick to whip up with just a few ingredients. 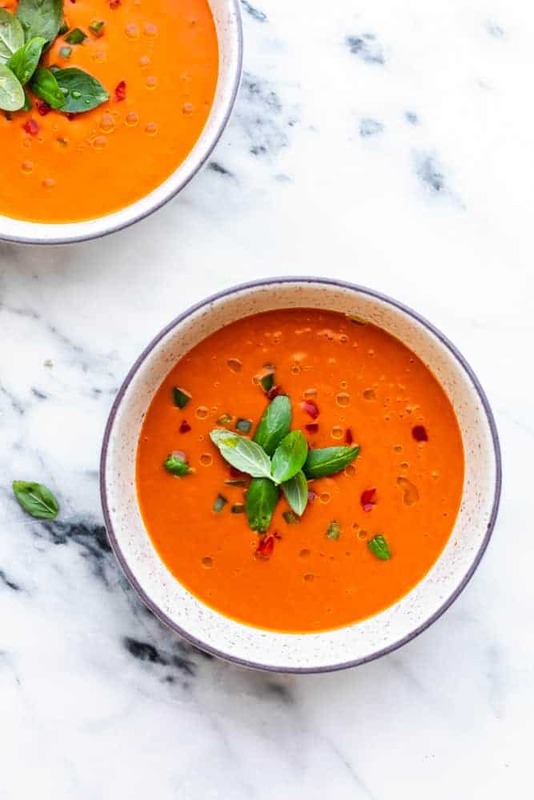 I’m a big fan of soup and it’s great to have some cool soup options for the hot summer days. This gazpacho soup fits the bill perfectly and goes well with many different types of entrees. One of my husband’s friends is not big on eating vegetables and it’s like pulling teeth trying to get him to order a salad. He devours gazpacho though, I guess he’s just a soup fan. My philosophy is “whatever works”… as long as people are eating veggies I’m happy. Add all the salad dressing ingredients in a jar or other airtight container. Cover, shake well and serve. You may keep it in a fridge for up to a week. In a small bowl, add minced garlic, salt and olive oil. Toss in the shrimp into the paste, stir until well coated. Lightly oil grill pan. Cook shrimp for about 2 minutes per side. In a large salad bowl, add shaved Napa cabbage, red cabbage, green onions, cilantro, and thinly sliced mango. Stir in a generous amount of salad dressing (about 5 tablespoons) , serve with grilled shrimp, toasted sesame seeds and chopped peanuts. Gazpacho soup, made of fresh summer vegetables, serve cold. In a high speed blender, combine tomatoes, red bell pepper, cucumber, garlic clove and onion. Blend for about 2 minutes. Slowly add sherry vinegar and olive oil into the mixture. Keep blending until smooth. Season with salt and pepper to taste. Strain the mixture with a strainer, discard the solids and transfer into a large jar, put in the fridge until cold for about an hour. In a mixing bowl, which together the honey, oil, vinegar, and cumin. Place pork chops in a re-seable plastic bag, pour in the sauce and let rest and marinade for about 1 hour. Pre heat the grill pan over medium heat. Cook the pork chop on the grill for about 3-4 minutes on each side. Season with salt and pepper if needed. This dish is looking so beautiful and colorful. I never think that cabbage and mango can be used together. Thumbs up to you for this lovely recipe. I defiantly gonna try this at my home. Thanks so much Ava!!!! xoxo! All of these are awesome dinner solutions for when it’s too hot to cook inside. I don’t currently have any outdoor space of my own and it makes me sad . . . eating summery dinners outside was one of my favorite warm-weather memories growing up. Everything about this is amazing! I love the food. I love the tableware. I love the food. Yes, I know I already said that. 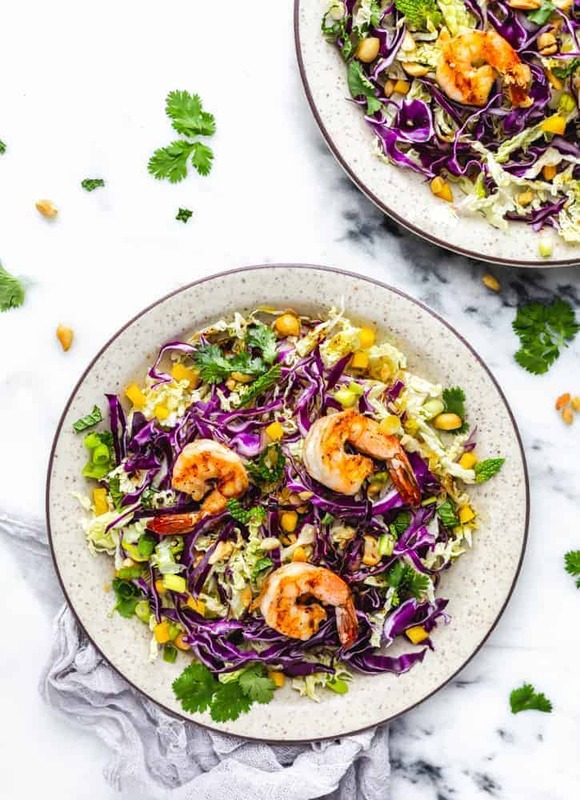 Oh my goodness I am loving your tableware and this salad with the shrimp sounds absolutely delicious – most definitely up my street and something I NEED to try! Oh my, I love mangoes and salad and you have presented it in such an inviting way. I need to make this salad soon. Cilantro is a favorite of mine as well. My kids and husband will love this dish. They are all about shrimp! I’d have the salad too, only I’d leave out the shrimp, because I’ve never been a fan. Wow! The tablescape looks so good and the salad even better! I love everything in it, especially the shrimp. I just happen to have everything I need to make that salad. Guess what we’re eating for dinner tomorrow? What gorgeous cookware! And your dishes are so fresh and colorful, they look delicious and make for a gorgeous plating. Thanks for sharing! this is such sweet and so delicious recipe ., thanks for this great new recipe a learn . First…love your dishes!! Second….that looks so fresh and perfect for this summer heat we are having right now. Yumm! This looks really good. We tend to find good deals on mangos but don’t know what to make with them. Now that looks like a yummy dish! Mango is so much fun to cook with. I need to try this! I love using cabbage in all of my salads. I’ve never had much of a liking for cabbage, but have to say this dish looks delicious! I enjoy mango and shrimp so I’ll give cabbage another try. Going to use this recipe! Oh my word! This looks absolutely delicious. I have to mention, I love the plate set you have too. That salad looks delicious. I love how colorful it is. Purple cabbage is one of my favs. This looks incredible! I’d love to try to make this at home. It looks simple and so healthy.